Four major grand-slams played each year in a tennis season. 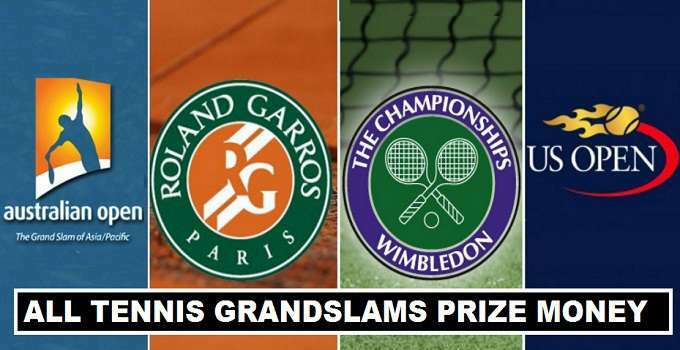 In past 5 years the prize money of these grands slams increase upto 13% each. Before the rise in the prize money of the events, a big number of tennis men and women player rise a question that they are not getting better money comparing to the other sports. Now the scenario is totally different the winner of the Australian open collects $2.8 million. The prize fund for the US Open tennis increased upto 10% and total adjusted amount is ($50 million) which will be provided to organize the event. Australian Open 2017, prize fund 13% more then its previous event. A$50 Million is totally suggested for the whole grand-slam. The winner of the competition in singles category both (male and female) players collected USD $2.8 million. Its is the very first grand-slam of tennis calendar. Roland Garros the second grand-slam, all matches played on the clay court. The prize money increase upto 10% for the event (USD $39.2 million). There are rumors that are ongoing that every year 15% increase in the prize money will be considered in next four years. The winner of the French Open singles earn (USD $2.29 million). Until, US Open prize money for 2017, reveled Wimbledon is the highest prize money tennis grand-slam. $40.79 million is overall prize money for the event. Singles winners of both categories earn (USD $2.92 million) as winning share and runner-up get paid (USD $1.5 million). Currently the biggest prize money grand-slam of tennis this year is (US Open) there is huge increase in the purse of this event. Total amount of $50.4 million will be make it one of the expensive tournaments in tennis.